Buffalo Bandits general manager Steve Dietrich had plenty on his mind entering the 2015 season. First, he had to figure out whether his team was the squad that had come within a single goal of playing for the National Lacrosse League championship, or the squad that had finished the 2014 regular season with an eight-game losing streak - or. more likely. a little of both. Then he had to find a way for the team to get younger without slipping in the standings. Since the Bandits drew big crowds to First Niagara Center, there was always financial pressure to keep the seats full. A major restructuring of the roster - in other words, a step back to take two steps forward - wasn't much of an alternative. "It's incredibly difficult," Dietrich said. "As guys get older, you've seen them compete. I've played with some of them, and Troy (Cordingley) has coached some of them. It's hard to let some of those guys go. But with the salary cap, you almost have to. And some of the young kids deserve a chance." The NLL Draft usually is the first chance for teams to start to retool for the upcoming season, and the Bandits completed a good-sized deal on draft might. Rory Smith had been a rugged defender during his one season in Buffalo, and became a favorite of coach Cordingley. That gave him some trade value at the age of 28, and Dietrich opted to cash in on it.The Bandits sent Smith along with goaltender Eric Penney and a second-round pick in 2014 to Vancouver. The Stealth gave a first-round draft pick in 2014, a second-rounder in 2014, another first-round choice in 2018, and transition player Nick Weiss. Then it was time to draft players, and the Bandits had an eye on Brandon Goodwin with that first-round pick. Goodwin at least knew Buffalo was interested in him when he turned on his computer that night. Buffalo had been on the older side when it came to left-handed shooters in 2014, with John Tavares and Shawn Williams both above the age of 39. This was a chance to add some youth to that spot. Williams eventually walked away from the team as a free agent, in part because of the failing health of his son, Tucker. The eight-year-old passed away in December 2014, and Williams took the 2015 season off. Tavares, however, was ready to come back for another season. "They (the Bandits' front office) thought I contributed enough last year to want me back this year. They left the decision to me. They thought I could still help out." The roster didn't go through too many revisions for the start of the 2015 season. Aaron Wilson and Glen Bryan were released. One old face returned in Alex Kedoh Hill, a transition player who had taken 2014 off while he searched for his passion for the game. Hill said he had found it again, and was ready to go. Rookie Jerome Thompson, the brother of ex-Bandit Jeremy, was the surprise of camp and made the team. Kurtis Wagar retired to spend more time with his family, throwing open the job of backup goalie. It was won by Davide DiRuscio, who if nothing else brought size to the roster. DiRuscio was about as big as an NFL lineman at 6-foot-7, 270 pounds. However, the biggest change of the offseason might have been one that didn't affect the roster at all. Dhane Smith, who had been used in a variety of roles in his Bandit career, was told his days as a utilityman were over. Smith had become a full-time offensive player. The league's only change in its team lineup couldn't have been too unexpected. The Philadelphia Wings hadn't played well in the previous few years, and playing in a large big-city arena with a shrinking fan base is a recipe for a shrinking bank account. The destination was a surprise, though: Uncasville, Connecticut, better known for its casinos and the home of the WNBA's Connecticut Sun. No one knew how that would work out, and no one knew how well the team would do. The Bandits were given the first chance to find out. Opening night drew only 5,768 in Uncasville, and they watched the New England Black Wolves win the first game in their history. 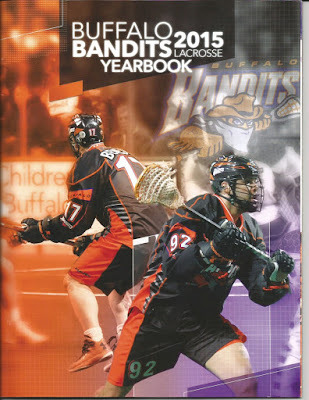 The Bandits fell, 12-8, with Dhane Smith providing one of the lone offensive bright spots with four points. After a week off, Buffalo flew to British Columbia for a game with Vancouver. This was a back-and-forth thriller, with Smith and Benesch scoring eight points each. The game came down to the final possession, with Buffalo up a goal. When a rebound appeared in the final seconds, Hill was there to grab it to preserve a 14-13 win. "Fortunately I was in the right place at the right time," he said about the play. The above-.500 record only lasted until Game Four on Jan. 22, when Toronto had an 8-4 edge in the second half to win, 13-11. Benesch had five more goals. Tavares suffered a calf injury in the opening minutes and missed the rest of the game and several weeks of play. A scheduling quirk brought Buffalo and Rochester together again on Feb. 21, and the story was about the same. A big third quarter gave the Bandits an 11-7 lead after three periods, but Cody Jamieson of the Knighthawks scored twice in the final 3:05 to tie it. Then the league's defending MVP struck again at 3:02 of overtime, and the Bandits had finished the season-series 0-3 with a 13-12 loss. "Rochester just seems to have our number," Hill said. At that point of the season, Buffalo had shown a disturbing tendency to collapse late in games, as they had been outscored, 40-16, in the final quarter. But the team found a cure against Colorado on Feb. 28, outscoring the Mammoth, 6-1, in the final 20 minutes to win, 14-11, and get back to .500 ... again. DiRuscio earned his first start of the season in that game because of a minor injury to Cosmo, and won it. The Bandits knew they had to sweep the Toronto Rock in a home-and-home series on March 13-14 in order to have any chance of winning the East Division. They earned the first half of that result with a thrilling, emotional 15-12 win. Buffalo had trailed, 11-7, with 16 minutes to go. Hill had a natural hat trick in the comeback, and he even led some cheers in Banditland during a postgame interview on the public address system. Benesch had four goals and five assists. "I had never been in a building that loud. Andrew Watt must have been 10 feet away from me on the floor, and I couldn't hear him," Nick Weiss said. But the Bandits couldn't finish the job the next night, as Toronto tied the game in the final minute and Brett Hickey scored at 2:07 of overtime to give the Rock an 11-10 win. The Bandits were sitting at 6-6 after 12 games, but were done with Toronto and Rochester for the season. Their remaining games were against teams that had losing records, which represented a golden opportunity to earn some wins, clinch a playoff spot, and get ready for the postseason. Step one was a 12-8 win over Minnesota, with the Bandits taking a 9-3 lead after 21 minutes. Mark Steenhuis led the way that night with six points. "It was nice to keep them at a distance for most of the game," Steenhuis said. The trading deadline arrived before the team's next game, and the Bandits pulled a small surprise. Buffalo sent Joe Resetarits to Rochester for Jamie Batson and draft choices. Resetarits had been considered a building block when he came from Calgary in a trade, but seemed to fall out of favor and had been scratched for the Minnesota game. The deal opened up a spot for Hill to become a full-time offensive player. April 4 represented the low point of the season, as lowly New England came in and handed the Bandits a frustrating 12-11 defeat in the First Niagara Center. "We were awful. It's just plain and simple. It's frustrating," Cordingley said. Buffalo's record had gone from 1-1 to 2-2 to 3-3 to 4-4 to 5-5 to 6-6 to 7-7. Has any pro sports team ever done that? It would take some checking to find out, but it has to be rare. On April 11, in what was Buffalo's last trip to Minnesota for at least a while (the Swarm moved to Georgia after the season), the Bandits earned a 12-9 win. Smith and Benesch had seven points each. They looked in danger of slipping back to .500 when they played a close game at home against Vancouver. However, Buffalo closed with a 10-3 in the final 27 minutes of the game to win, 17-9. Finally, the team was two games above .500, and the win clinched a playoff spot. Benesch finished with the league lead in goals with 55, breaking the team record of 51 in the process, and Smith (107 points) and Steenhuis (95) joined Benesch (113) in the league's top 10 in scoring. Jay Thorimbert set league records for faceoffs won (338) and for loose balls (246). Hill had become a unique weapon, someone who could supply speed and offense (49 points) no matter where he played. Tavares finished with 32 points in 10 games. On defense, Steve Priolo had picked up his game another notch, and the team had some transition players that could create offense when the chance came. Optimism was running high as the Bandits entered the playoffs clearly playing their best lacrosse of the season. However, Rochester was in the way. The Knighthawks had finished second in the NLL East, and thus hosted the one-game playoff series to determine which team would play Toronto in the next round. The Bandits had already lost three games to Rochester, and probably needed a good start as a confidence boost. They didn't get one. The Knighthawks jumped out to a 5-1 lead after 10 minutes. Buffalo got within a goal a couple of times, but couldn't maintain the momentum long enough to take the lead at any point. Resetarits, in his first game against his old teammates, had four goals. "It's hard to beat anyone three times in a season, let alone four," Tavares said. "We did make some strides this season, but we need to get on our home floor for those games. It would give us that extra bit of confidence." Cordingley added, "They outwilled us in every way. It's a bitter pill to swallow." The Bandits had taken some positive steps in 2015. Young players like Smith, Priolo and Hill looked like the young nucleus that the team needed to develop. Still, the Bandits were looking up at old rivals Toronto and Rochester - mostly because they were 1-6 against them combined when the postseason game is included. The offseason figured to be a time when Dietrich would be working on ways to find some depth and move up the ladder.